Tropfest SEA 2014 which held at Penang Esplanade yesterday was awesomely ended, I saw lots of people went there to support young and creative film makers; there are total of 12 finalists and the theme for this year Tropfest is RICE. Sitting on the grass (I was actually sitting on the cube chair provided by Digi) with group of people and watching the short films together make me feel like it was a backyard cinema, so nice! Food and beverages stalls are provided but not much choices, end up I went to hunt for supper after the event. I'll let my photos to do the talking because I'm so lazy to write, enjoy scrolling and enjoy my photos too. Watched total of 12 short films and I really feel youngster nowadays very talented to make a film like this. Congrates to the winner Sothea Ines from Cambodia, if you missed the event, you can actually watch her short film here. 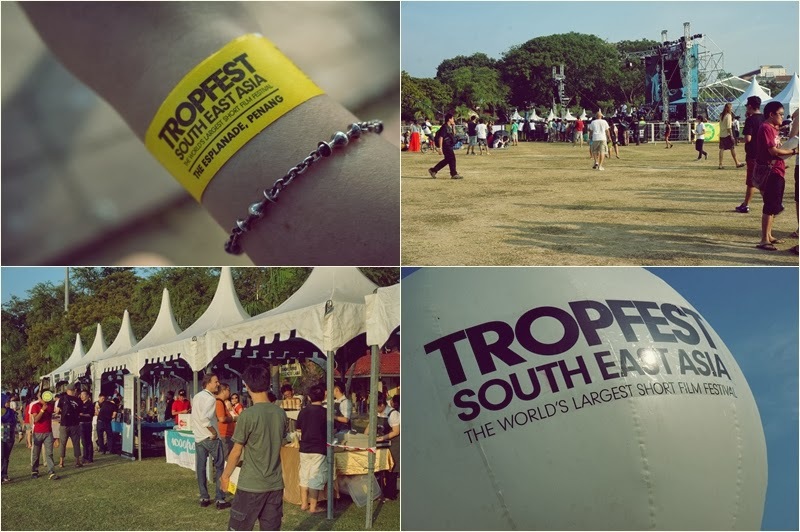 Before the Tropfest ended, they actually announce Year 2015 Tropfest SEA theme which is WHEEL, for more info, please follow their website. Found a booth during the event which caught my attention due to their simple yet nice design and decor I think - Scoops which selling ice cream. Their ice creams are homemade, preservative-free and come wih unexpected flavors such as chempedak mint, mango pulut, LOL (Lots of Lemon, this really make me lol), banana pistachio and many more. Of course, they are also selling those normal flavors if you wonder. They only makes two flavors last night which are nutter butter and gula melaka ice cream; I choose the latter, really love the rich and creamy texture! They do not have own shop now, so if you want to get their ice cream, please email them on scoops.pg@gmail.com or leave a message in their facebook page. They have rum and raisin flavor, my all time favorite! Wink. CNY please come faster, I wanna wear my new clothes asap!